The petrol and diesel fumes coming from … cars is terrible. Because of my work, I really notice it. Myself and other rickshaw drivers experience and see the source every day, first hand. There’s a lot of cars and traffic. We don’t have any air-con or fans, so we experience the full force of the pollution. 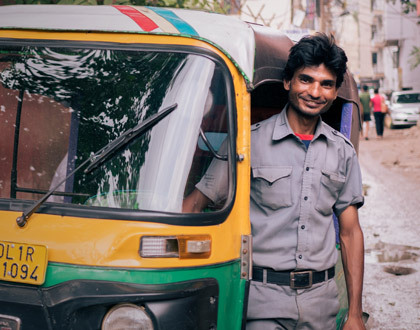 Mohammed Tafiq is a rickshaw driver from Delhi, working on the traffic filled roads every day. He says his regular fevers are a direct result of breathing the air. There’s definitely more traffic, but sometimes it’s not always easy to monitor it when you’re in it … because it builds up under your nose without you realising. I think it’s more, maybe when people get in the back of the cab and they haven’t been to London for a bit they go: ‘Oh my God, look at the traffic – isn’t it bad’. 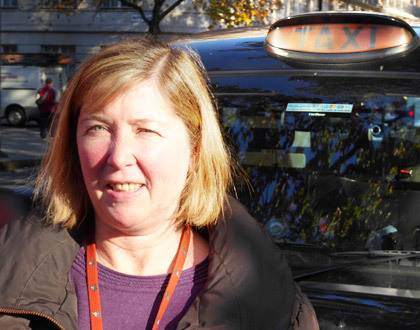 Louise Osbourne drives a London black cab, and has been doing so for 24 years. She recently drove for a day with an air quality meter in her taxi. She has noticed that – despite traffic calming and the congestion charge – traffic has been rising. My rickshaw is always open, [and] the air passes through it when I drive. So I feel the changes in the air quality when I go from area to area. Sometimes it’s very dusty, sometimes it’s very smoky and sometimes it’s full of exhaust fumes. I cough when I’m stuck in traffic, the air gets into my nose and chest and I have to cough and spit a lot. 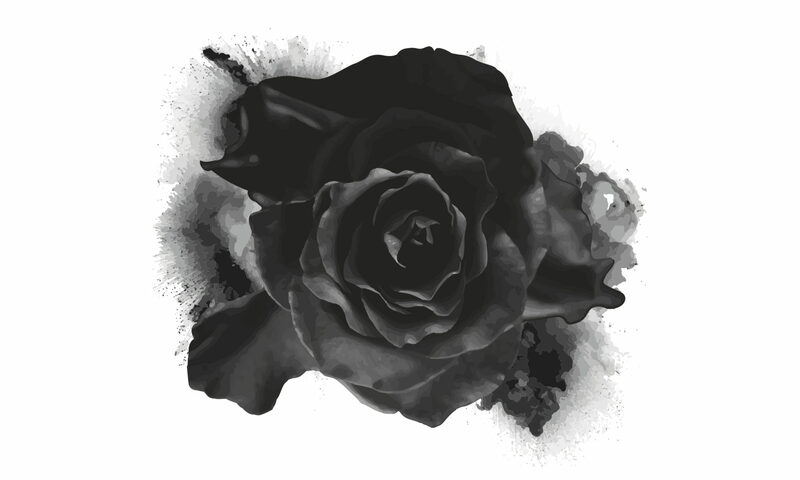 On the roads, I can notice that the air is changing… Sometimes I get a really bad cough and occasionally a fever. The cough and fever come when the air is very thick. It gets so bad I can barely breathe. I believe the air is weakening my body and is making my illness worse. The calcium in my bones is lowering because of the air pollution too. When there’s a lot of traffic, I get very tired when the pollution levels are high. Fatigue is a really big problem. It will be getting worse because there’s certain areas … that are really heavily congested all the time. So that is a definite reason that the air will be worse. And there’s no avoiding it in driving around in a different place because there’s somebody else there as well. And, you know, we sit in the middle of the road all day long, so we want the air to be better. We want the traffic to move better, but how you go about that? There’s a lot of tweaks that could probably help it, but are people willing to do that? And then … when people come into London and the traffic moves faster, then they’ll think: ‘Aha! Maybe I’ll drive next time.’ So, [there is a] downside, if you see what I mean. More CNG cars should come in. My rickshaw runs on CNG, so the emissions are much less harmful. There should be a reduction in the number of petrol and diesel cars on the roads. If people switched to CNG or electric cars that would make a big change for me personally. Planting more trees would help too. There was a suggestion, one of the cab drivers said that, if the government bought these electric cabs and funded them to the drivers, the fines for the air quality would come down … and it’s about looking at the whole picture and the bigger picture. It’s difficult really because the whole government’s in turmoil. Sandeep Kumar is an ola driver in Delhi, a taxi which is shared between passengers. He has worked in Delhi for more than three years. The smoke particles are so fine that his ola air-conditioning can’t stop them coming in and staining the inside of the car. Maybe we’re just running out of space for all the things that want to be there. It’s quite sad to hear that, sometimes, there might be one parcel in a van, because someone had to have it that next two hours. Everybody wants things instantly.